Annagh United manager Ciaran McGurgan. The current league leaders enjoyed a 4-1 success away to Newington last Friday and now aim to protect top spot in the table by visiting Lisburn Distillery tomorrow (Saturday). Queen’s sit level on points and with a game in hand but trail Annagh due to the superior goal difference of the Portadown club. With four games remaining - starting on Saturday against a Distillery side expected to have a fresh management team in place - Annagh’s promotion bid will come down to a top-two finish. “The league champions go up automatically and then the runners-up face a promotion play-off against a Championship club but only clubs with a Promotion Licence can benefit from finishing in those two positions,” said McGurgan. “All we can do is focus on clocking up those wins and see how things stand. “We have scored 51 times over 18 league games and only Queen’s can point to a better defensive record so far. “It is about drawing confidence from sitting in this position entering the run-in as we know the stakes will only increase closer to the end of the season. “Every point counts at this stage and in this league we’ve seen how any side can take points off another, so that makes every matchday important. “You cannot predict results and we’ve found in previous games it might finish in a comfortable scoreline but the match has not panned out that way during play. “That is why game management is crucial and at this stage of the season it is brilliant to have people with the experience of Michael Gault, John Convery and Niall Henderson. “We’ve managed the players across the season and will utilise some players for certain situations, like needing people who can control and manage a match. “But sometimes it is about sending out a side with lots of energy and pace. “We have four players on a double-figure tally of goals - with John Uprichard, Ruairi McDonald, Craig Taylor and Scott McCordick in great form. 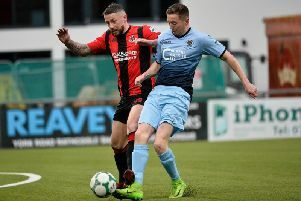 “Ruairi is a midfielder but sits so close to the top of the scoring charts across the whole division, so that is a credit to the players and how they’ve adapted to what we want in terms of formations, tactics and selections. Kick-off will be 3 o’clock on Saturday at Lisburn Distillery.